Rated load (kg) : 80, 100, 120, 150, 200 With our deep commitment, we have established ourselves as a reliable Exporter, Importer and Supplier of Load Cell CZL-601AC. Load Cell (CZL-601AC), which we offer is made of alloy aluminum, hermetically sealed with glue to IP65. The surface of Load Cell (CZL-601AC) is anodized and protected against corrosion. 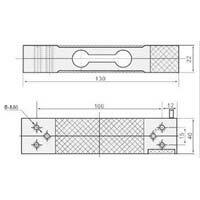 Load Cell (CZL-601AC) is generally used in electronic table top scale, floor scale and other weighing equipment.